Adjustable reciprocal and surge rates (ramped). Adjustable pulsation rate (1 - 80 Hz). Wall-mountable for convenience in the treatment room. Combination therapy capability with Amrex® Model U/50 (AMX-201STD). Two-year warranty on parts and labor; batteries excluded. TENS/EMS Units & Stimulators can be found in our extensive online collection of products from globally recognized and trusted brands, including Amrex. 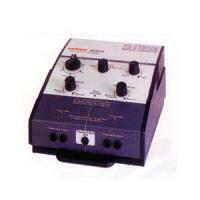 An excellent option to consider is the MS324A Two-Channel Low-Volt AC Muscle Stimulator.